This promotion is a partnership with COMET TV + CHARGE! and all materials supplied have been provided by COMET TV + CHARGE!. Rocky! Godzilla! Space: 1999! FUNKO POPS! 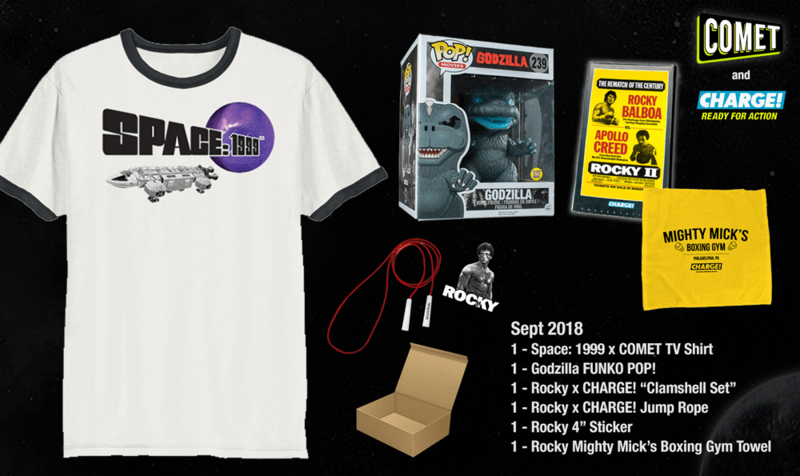 We’ve partnered with COMET TV + CHARGE to offer the September 2018 Prize Pack giveaway! One winner will receive one prize package including the items listed below (winner drawn randomly). Enter by midnight, October 3, 2018 using the Rafflecopter form below (U.S. only, must 18 or over, no P.O. boxes). Catch a Rocky Double Feature every Thursday starting at 2/1 C and 8/7 C.
I like Godzilla 2000 the best. Godzilla vs. the Sea Monster is my favorite movie. the one with Raymond Burr, its the one that got me hooked as a kid. My favorite Godzilla movie is (Godzilla vs. Mothra. Godzilla vs. Mothra is my fave! Godzilla 1998, it was my son’s b’day wish and just full of good memories going to see it. It’s hard to pick one favorite, but I really enjoyed Godzilla vs. Megaguirus. Seeing Tokyo overrun by swarms of prehistoric dragonflies was a hoot, though the ending was a bit disappointing. Thank you for the chance to win. The first original Godzilla movie is my favorite. I was mesmerized watching it as a kid. I loved the original. It’s what first made me a fan! I love Godzilla VS. Mothra! The first old Godzilla movie, even though it wasn’t made well. Godzilla vs Mothra is my favorite. I love all the Godzilla movies especially the first one.